An inside look at, math teacher, Julie Lowman's new book. Julie Lowman is both a skilled math teacher and a talented writer. Last summer, she wrote a novel called “The Intensity of You.” “I wanted to write something that was applicable to high schoolers and the issues they face,” Julie Lowman said. Julie Lowman is an AP Calculus teacher at SPHS, alongside being the department chair for mathematics. Not only is she an expert math teacher, Lowman graduated as high school valedictorian, then attended Johns Hopkins University where she majored in applied math and psychology. Although writing was never Lowman’s forte, she recently pursued her long-awaited goal of writing a novel. “I didn’t take any writing courses, I actually dropped out of the only writing course that I took,” Lowman said. Lowman has been writing stories since she was little, such as a short novel for her family when she was just 12 years old. Despite the lack of writing classes during her college career, Lowman continued to write for pleasure, including a play that was performed by her classmates. “I wrote a play that was performed in college by the student theater group, and then I kind of went to writing short stories just for me,” Lowman said. She has written approximately 50 short stories over the years that she does not plan on sharing with anyone. Lowman’s new book is a contemporary novel for young adults called “The Intensity of You.” The main character is Sydney, a 15 year old girl who becomes an orphan after her parents’ unfortunate deaths. She begins a relationship with Tyler, captain of the lacrosse team and a “golden boy” that everybody loves. “She started dating him right after her parents died, so he filled a void for her and helped her through that grieving process,” Lowman said. However, Tyler has an intense, controlling side of himself that nobody can see except Sydney. “I wrote it with the One Love campaign in mind, so it’s about an unhealthy relationship,” Lowman said. Although it took just six weeks for Lowman to write the novel, she has had this idea in mind for quite some time. “I had this dream about a year ago, right before Christmas. I had these two characters in my mind and in the next four weeks I just wrote, wrote, wrote,” said Lowman. She had never before written an entire novel, so when it was finished, Lowman sent it to numerous friends and coworkers to get feedback. “I was so excited so I started to send it out to publishers, but I was getting a lot of rejections,” she said. Lowman realized that she did not want to have all her eggs in one basket, so she decided to write a second book. “I wrote a first one, but then I went and I wrote this one over the summer and I put a lot more thought into it,” Lowman said. After writing the second book, she made sure to do many revisions, such as “changing the whole ethnicity of this one character and his family.” Lowman also peer-edited her book with a woman she met on Twitter, where they read one another’s pieces and gave each other feedback. “She actually gave me an idea of switching the first two chapters which worked really well,” Lowman said. Inspiration sprouted in Lowman’s head when she was looking at the One Love campaign posters around the school. 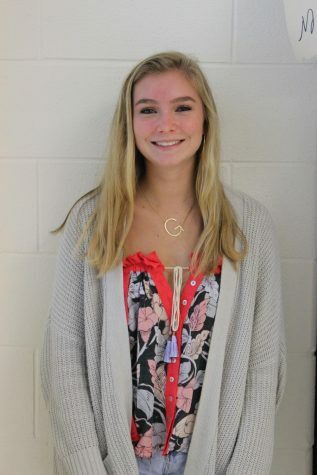 “I wanted to write something that was applicable to high school students and the issues they face,” Lowman said. She combined bits and pieces of relationships she has seen with small details of her life, such as the broken console in her car that does not stay shut. “I took little pieces from people that I know… that I had seen from family members or friends who have gone through similar stuff,” Lowman said. “The Intensity of You” is available on a website called “Swoon Reads,” where anybody is able to post a young adult novel. “It’s connected to Macmillan, the publishing house, so they decide to give publishing deals to some people,” Lowman said. If a book is chosen to be published, the author can obtain a book deal through Macmillan Publishers.